Dataset challenges assume the datasets will be created and modified using dataflows. Carefully follow the naming conventions as specified in the scenario for dataflows and dataset names since they're used to validate the challenges. Use lowercase spelling for dataset aliases. For datasets containing spaces in its name, use the underscore (_) in dataset aliases. You will be asked to create lenses as part of the challenges. Set Limit is the best practice for Top-N analysis or you may want to try a SAQL query. However, superbadge validation requires a simple Focus or filter. Review the entity relationship diagram as you read the detailed requirements below. Use the Analytics SAQL Reference Guide to help you with SAQL syntax. The Let's Play Salesforce Youtube channel also has helpful videos. To complete the challenges, you need to pre-populate the Account object with data associated with this superbadge. Import the Agency Data.txt file into the Account object in your Einstein Analytics DE org. After you've imported the Account object, you'll be ready to tackle the challenges. Download ea-data-preparation-specialist-data.zip and save it to your desktop. Use the Salesforce Data Import wizard. In Setup, enter Data Import Wizard in the Quick Find box and select Data Import Wizard. Select Add New Records. For Match contact by and Match Account by, select --None--. Click CSV. Select Choose File and navigate to Agency Data.txt on your desktop. Click Next. Click Next, then Start Import. Click OK when finished. Create an App for your work. Type Mosaic in the name field and click Create. In the 5 years since The Mosaic Council started, this nonprofit has made impressive strides in its mission to help create a better world. Mosaic values the adage that charity begins at home and focuses on doing work for its local community. To serve its overall mission, Mosaic also partners with globally focused humanitarian agencies. One of its more successful local programs helps communities interested in establishing fruit and vegetable gardens. In addition to beautifying neighborhoods and building a sense of community, the gardens provide fresh produce to local food banks and shelters. This is where you come in: You just got a welcome call from Mosaic’s Executive Director, Yasmine Vazquez, about a new venture Mosaic has been asked to lead. Yasmine reached out to you because you’ve worked with Mosaic in the past, helping get its org off the ground, so you schedule some time on your calendar and head down to Mosaic's offices. You learn that Mosaic has a new project unlike anything its done before, an opportunity too exciting to pass up. Building on previous success with community gardens, Mosaic has been asked to form and manage a seed trust and oversee the distribution of seeds to small farms around the globe. Mosaic will work directly with international agencies, which will be responsible for delivering seeds to farmers that will participate in the program. In the planning session you spend time discussing the program and Mosaic's goals for it. Mosaic has already piloted the program and accumulated some data that you’ll use to get started. Mosaic has acknowledged that there are several unknowns, which may prevent expanding this project. As you dive in to the project, you're thinking that Einstein Analytics can help them gain a better understanding of the data they currently have, which can help them plan for the future. Yasmine is not familiar with Einstein Analytics, but after you give her the rundown she’s open to try it. Mosaic’s stakeholders have been important in the past when it comes to driving requests, defining data needs, and directing what needs to happen. Plus they’re the go-to people for questions or approvals. Seed Bank Agencies dataset originates from the Salesforce Account object-which contains records imported from an external file, Agency Data.txt. New fields were later added to Agency Detail.txt since the import, and the Seed Bank Agencies dataset needs to be updated with those fields. Each agency must have temperature data which will come from the Global Climates.txt file. Each seed must also have temperature data that will come from the Temperature Mapping Classes.txt file. 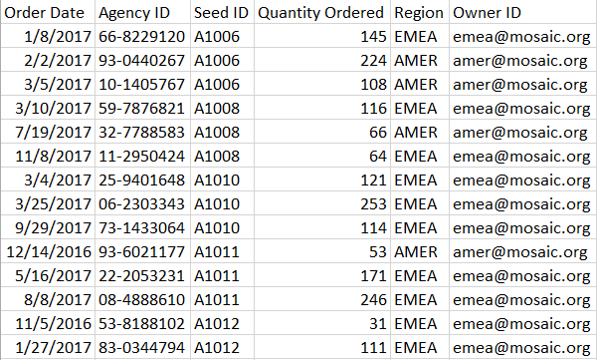 Seed Bank Orders dataset maintains orders placed by agencies in the Seed Bank Agencies dataset and the seeds the agencies ordered listed in the Seed Bank dataset. Mosaic’s project volunteers all have their own areas of Salesforce expertise, such as creating and navigating reports and dashboards, or functional knowledge of databases. They’re all excited and ready to roll up their sleeves and jump right in. Your job is to take what each volunteer brings to the table, and enable them to work with Einstein Analytics and make Mosaic’s seed distribution goals into reality. You want to give everyone a chance to help-after all, that's what they do best. But, first you need to learn what each of them can do as you determine the permissions they'll need for their new roles working with Einstein Analytics. Philip, Danielle, and Benito couldn’t be more excited about the opportunity. Benito is Mosaic's go-to expert on Salesforce reporting. You think he's ideal for dashboard development and validating datasets. Danielle and Philip are comfortable with Salesforce core and databases in general, so they can also help with dataset validation and will likely take on data preparation and adminstration tasks once your job is done. Yasmine, Hadiqa, and Tonya are the managers and principal contacts for the Seed Bank program, and they’ll be the ones deciding which information is most important to draw from the data. From your analysis, they won't have an active role with administration and maintenance, they will be the endusers. During your discussions you begin planning for multiple integration operations. You don’t want to depend on a single operation that can slow down data transactions. To help Mosaic operate data preparations at optimal performance, Enable Data Sync on Mosaic's org. Mosaic will be working directly with international agencies, which will be responsible for distributing seeds to farmers participating in the program. 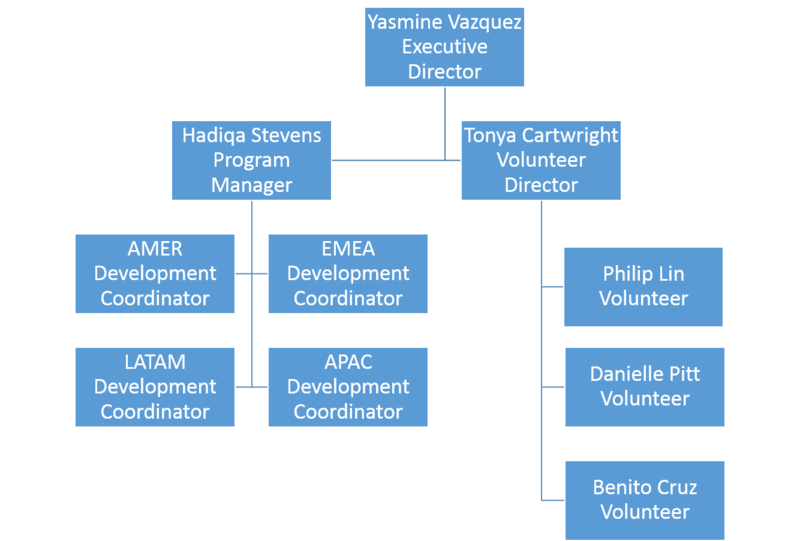 Yasmine has asked Tonya to manage this aspect of the project. Tonya explains that Danielle and Philip imported the records from a flat file, Agency Data.txt, into the Account object, saving Mosaic a lot of time lost on manual data entry. However, since the import, Mosaic had to collect additional data for reporting purposes related to the agencies and the regions they represent. They’ve documented the latest updates to Agency Detail.txt, but they haven’t added the fields to the Account object yet. You explain custom fields won’t be necessary and that you can add them in Einstein Analytics when you create a new dataset for the Seed Bank. Tonya is pleased, since the added fields are Seed Bank-specific and she’d like to limit records going into Einstein Analytics to just those associated with the Seed Bank. Going over the fields, you come across one, Acres, that looks quite specific. Tonya explains that the Acres field will be used to determine if a given farm has enough land to cultivate a specific crop, since local agencies have already gone through the process of documenting the average size, in acres, of farms participating in the program. In your process you will create a new Seed Bank Agencies dataset. Load the pre-populated Account object. Load the Agency Detail.txt file to update the Account object with the recently added fields since the initial import. Create a filter to select records associated with the Seed Bank project from the Account object. Add the custom fields from the Agency Detail.txt file to the Account object. Register the Account object as the new Seed Bank Agencies dataset. Yasmine is curious to see what Mosaic will be able to do with the new datasets you'll be creating. With that in mind, you show Benito how to create lenses from the datasets for the executive team to experiment with. Filter Agency Records Use IsAgency to filter records in the Accounts object associated with the Seed Bank project. Add Agency Fields Adds the following fields from the Agency Detail.txt file to the Account object in the dataflow. Use account number from both sources as the key. Set the Relationship to AgencyDetail. Create Seed Bank Agencies Registers the Seed Bank identified records from the Account object as the new Seed Bank Agencies dataset. Build a Top 5 Agencies lens that displays the top 5 agencies participating in the Seed Bank Project. From the Analytics Studio tab, click Datasets. Click the Seed Bank Agencies dataset. Click the (+) under Bars and select Account Name. Click the Count of Rows header on the chart to list the values in descending order. Place your mouse on the first bar in the chart and highlight 5 bars. Click the Focus button on the upper-right of the lens. Click the Save button, add the title Top 5 Agencies and select Mosaic as the App. Click the Save button when complete. Click the X next to the new lens tab to close. Mosaic has a local seed vendor that promised to donate seeds and advice for the Seed Bank. Mosaic has the vendor’s inventory file of donated seeds. Hadiqa manages the relationship with the vendor. On top of that, she’s Mosaic’s resident horticultural guru. She’ll help you with her product expertise as you build a seed bank in Einstein Analytics. Hadiqa goes over the seed file with you during your consultation. Hadiqa confirms that the data doesn’t have any glaring anomalies. However, there are project requirements that require some changes to the file before it can be useful. Seed donations are made in bulk, noting the number of seeds per pound. The value can be as low as 5 seeds per pound (for avocado seeds), or as high as 1,000,000 (for celery seeds). Hadiqa also tells you about the Spacing field, which documents seed spacing. This sounds a lot like the Acres field, and you ask her if they’re the same. She explains that the fields are related, but not the same. Spacing stores the amount of space, in square inches, that each seed needs to grow. In some regions, farmers don’t have as much land—some an acre or less. Mosaic will need to know if a farmer’s land can accommodate a certain number of seeds, especially if requests come in for multiple seed types. According to Hadiqa, the best way to figure this out is by knowing how many acres are required per pound of seeds. 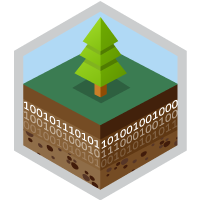 Create a dataflow that loads the seed data into a new Seed Bank dataset. In addition, the process must include a step to create a new Acreage field. In your process you will create a new Seed Bank dataset. Load records from Seed Chart.txt. Create an Acreage field that calculates the amount of land for each crop seed. Register the new Seed Bank dataset. Create a lens from the Seed Bank dataset. Calculate Acreage Uses the following formula to create a new field, Acreage, (Seeds_Pound*Spacing)/6272640 [square inches per acre]. Set the Precision to 18 and Scale to 6. Build a Top 5 Crop Seeds lens that displays acreage for the top 5 seeds in the Seed Bank. Click the Seed Bank dataset. Click the (+) under Bars and select Seed. Click the Sum of Acreage header on the chart to list the values in descending order. Click the Save button, add the title Top 5 Crop Seeds and Mosaic for the App. Mosaic is adding staff for the Seed Bank project, and Yasmine wants to limit visibility for those roles to just those regions they will manage. Under her guidance, Philip set up security within the org to make it possible for these roles to view only agencies within their assigned regions. Also, they should only view their region’s orders from the Seed Bank Orders dataset. Yasmine, Tonya, and Hadiqa will view every order and agency. Hadiqa has consulted with Mosaic’s seed vendor about the best environment for each seed to thrive. Each seed in the inventory file lists a temperature range in Fahrenheit. This is important information, since a crop that requires lots of sun and humidity wouldn’t do well in a locale that’s cool. As a result, when requests come in, Mosaic wants to know if a region can accommodate the requested seed type. Hadiqa asked Danielle, who studies at a local university, if she can get climate data from her school’s Atmospheric Sciences Department. Danielle came back with a column-separated values file that contains year, temperature, and country. The university gave her data going back to 1991, but the seed vendor said that one year of data is enough for your purposes. The vendor also mentioned that Mosaic may want to consider using temperature classes as a simpler alternative. Temperature classes include Polar, Cool, Tropical, and Continental. Combined, those zones cover the globe. Most regions and crop seeds will carry multiple temperature classes. For example, Afghanistan is Continental for most of the year and Cool during the winter months. Cabbage seeds can grow in regions that are Cool, Continental, or Tropical. Hadiqa likes this method because it’s simpler than trying to gauge temperature ranges between an agency's region and crop seeds. To help Mosaic send seeds to matching climates, a temperature class needs to be added to each agency and seed inventory record. The previous dataflows for the Seed Bank Agencies and Seed Bank datasets are working very well, and for testing purposes you’re thinking it may be best to add modifications to new dataflows. Download copies of the Load Seed Bank Agencies and Load Seed Bank dataflows and upload them into new dataflows as described below. In your process you will add a TempClass field to the Seed Bank Agencies and Seed Bank datasets. Upload the Load Seed Bank Agencies dataflow into a new Load Seed Bank Agencies w/Climate Data dataflow. 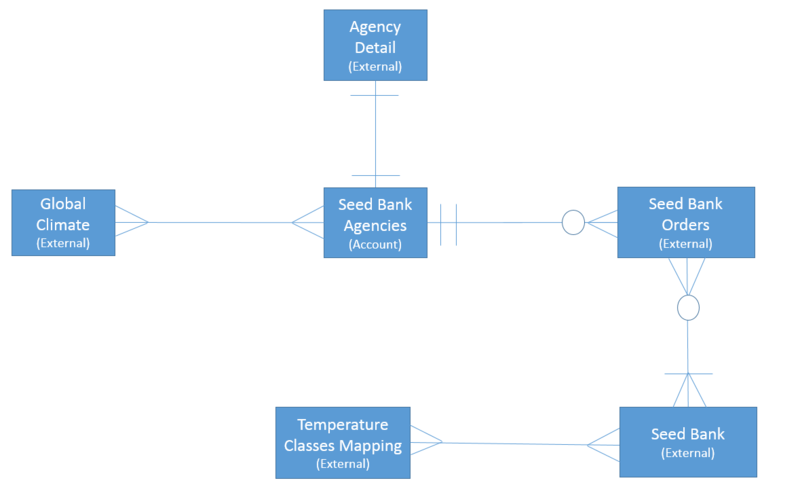 Upload the Load Seed Bank dataflow into a new Load Seed Bank w/Temperature Classification dataflow. Calculate a new TempClass field for the Seed Bank Agencies dataset using data from the Global Climates.txt file. Calculate a new TempClass field for the Seed Bank dataset using data from the Temperature Classes Mapping.txt file. Create lenses from each dataset displaying the top temperature class. 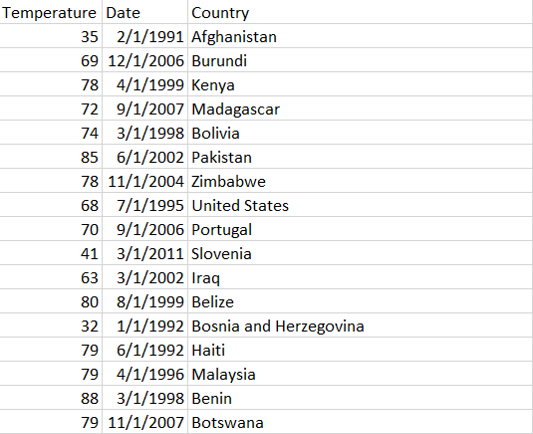 Add Temp Class Uses data from Global Climates.txt to calculate a new TempClass field. Set the default TempClass to Continental. Augment TempClass Adds the TempClass field to the Seed Bank Agencies dataset. The field will store one or multiple temperature class values. Use Country from both sources as the key and set the Relationship to Climate. Create Seed Bank Agencies Registers the Seed Bank Agencies dataset with the new TempClass field. Build an Agency Temp Class lens that displays the top temperature class. Click the (+) under Bars and select [Climate].TempClass. Click the first bar in the chart to highlight. Click the Save button, add the title Agency Temp Class and Mosaic as the App. Define Temp Range Identifies the low and high temperatures from the Seed Bank Temperature field. Add Temp Class Use the temperature classes table above to help you calculate a new key field to join to the TempKey field in the Temperature Classes Mapping file. Augment Temp Class Augments the TempClass field from the Temperature Classes Mapping file to the Seed Bank dataset. The field will store one or multiple temperature class values. Set the Relationship to Climate. CleanUp Use this node to drop fields not listed in the Create Seed Bank output. Create Seed Bank Registers the Seed Bank dataset with the new Temp Class field. Build an Seed Bank Temp Class lens that displays the top temperature class. Click the Save button, add the title Seed Bank Temp Class and Mosaic for the App. You’ve made great progress developing data loading processes, but you have a previously scheduled site visit with another client coming up and will be away for a week. While you’re away you call to check in. A relieved Danielle gets your call and tells you that she and Philip need your help with one of the dataload jobs. Tonya and Hadiqa want to do targeted analysis of each seed bank agency’s order from the seed bank. Previous orders had been manually documented in a Seed Bank Orders spreadsheet. Much of the data they’ll need along with the orders exists in the Seed Bank Agencies dataset. Instead of building a new dataflow and dataset, Danielle and Philip tried updating the Load Seed Bank Agencies dataflow by adding the Seed Bank Orders file. Danielle tells you they accidentally deleted some nodes and tried restoring them; however, the dataflow won’t run. She’s also not sure if they used the right nodes and whether they were set up correctly. You commend Danielle and Philip for their initiative and assure her the dataflow can be fixed. You ask her to download the dataflow JSON and email it to you to look over. For this challenge, you need to diagnose and repair the dataflow, Load Seed Bank Agencies with Seed Orders [Broken], and restore it as a new Load Order History dataflow, then build a lens for Tonya and Hadiqa to review. Upload the Load Seed Bank Agencies with Seed Orders [Broken] dataflow into a new dataflow, Load Order History. Diagnose and repair the dataflow as needed. Create a lens from the Order History dataset. Build a Top 5 Seed Bank Orders lens that displays the top 5 orders from the Seed Bank. Click the Order History dataset. Click the Count of Rows under Bar Length and select Sum | Quantity Ordered. Click the (+) under Bars and select Seed_ID. Click the Sum of Quantity Ordered header on the chart to list the values in descending order. Click the Save button, add the title Top 5 Seed Bank Orders and save to the Mosaic App.